Buy Interstellar Variegated Metal Leaf for Sale here. Each book of Brass Leaf contains 25 sheets of Leaves 5-1/2" x 5-1/2"Average Coverage area for a book is 5.25 square feet. Variegated Metal Leaf-Interstellar book looks like a Golden Leaf base Ragged with Blue green and Deep Copper Spots with a Intense blue outline. The 2nd side looks like a light brass with darker Golden wash in the middle that has a cracked circular pattern reveling a little blue bleeding through from the 1st side and bit of copper on edges. Variegated Metal Leaf-Interstellar is available in Books or in Packs of 20 books. Pricing listed Below. Variegated Metal Leaf-Interstellar 20 Book PackBuy Variegated Metal Leaf-Interstellar 20 Book Pack for Sale here. 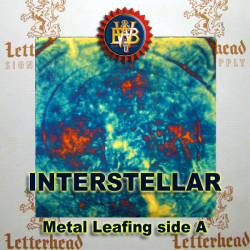 Each book of Brass Leaf contains 25 ..
Variegated Metal Leaf-Interstellar bookBuy Variegated Metal Leaf-Interstellar book for Sale here. Each book of Brass Leaf contains 25 sheets of Leaves..